CNC Shark Pro Plus, Just released at IWF 2010! New Items on the Shark Pro Plus Enhanced controller with more power that allows up to 200 inches per min Increased travel on the machine with a max cutting capacity of 25 x 25 x 5 inches Automatic on and off software control of Router Professional Aluminum case with Push button Estop. Includes V-Carve 5.5 software, 1/2” dia. V-groove Bit and two hold-down clamps! 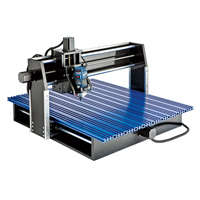 Bring the speed and precision of computer-controlled machinery to your shop with this top value CNC system! With a table measuring 28-1/2” x 36” it’s ideally suited for carvings and machining operations on a large variety of signs, doors and other small projects. It boasts impressive power, speed, accuracy, and ease of use. With its robust steel and high-density poly-ethylene construction, it can take accidental impacts that would normally damage or destroy an aluminum or MDF machine. It is fully compatible with the Bosch Colt Palm Router and includes a 1/2″ diameter V-groove router bit. The CNC Shark also includes the new version 5.5 of the VCarve Pro software interface — a $600 value. You supply a PC computer with USB 2.0 port and a Bosch Colt router (router sold separately). Simply connect the USB cable to the controller box and the other end to your computer (not compatible with Mac computers). Visit a store near you for a live Demo! Introducing CNCSharkTalk.com, a new website presented by Rockler where CNC Shark and CNC Shark Pro users can chat together, watch how-to videos, ask questions, learn from each other and even show off their CNC Shark projects. Now online – visit today! This entry was posted in New Products, Power Tools and tagged CNC Shark Pro Plus, Just released at IWF 2010! by bdks. Bookmark the permalink.